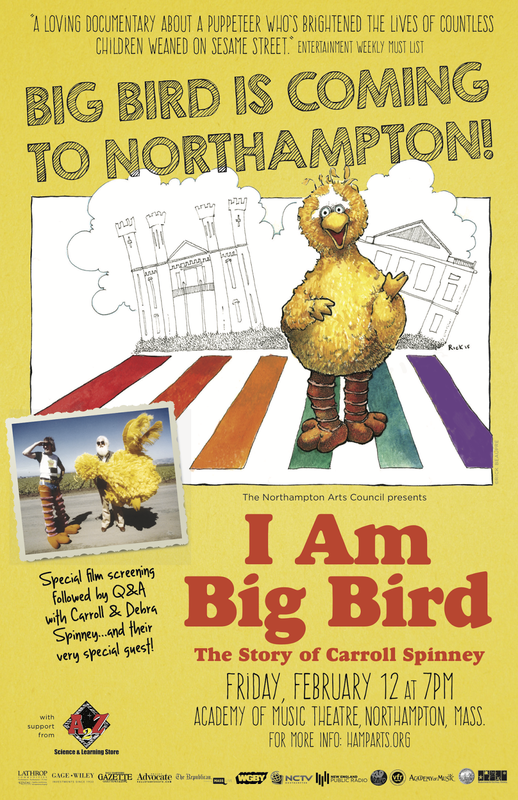 The Northampton Arts Council invites you to a special film presentation of “I Am Big Bird: The Caroll Spinney Story” on Friday February 12th at the Academy of Music Theatre in Northampton. The film will be followed by a Q&A session at which Mr. Spinney, his wife Debra and a very special guest will be discussing their journey and answering questions. This heartwarming documentary chronicles the life of Caroll Spinney, the man who has been Sesame Street's Big Bird and Oscar the Grouch since 1969. For over 4 decades, Caroll's characters have been cherished by generations of children. 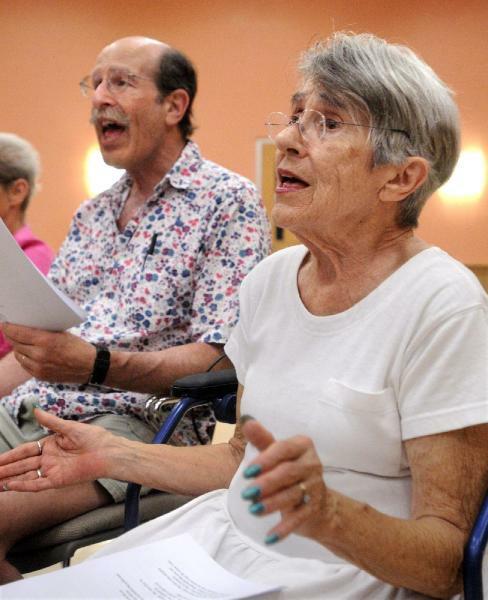 At 81 years old, the tenacious and enthusiastic performer has no intention of slowing down. 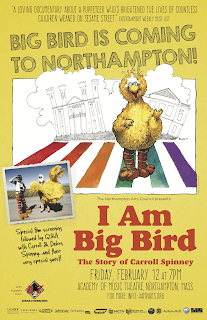 I AM BIG BIRD features incredible footage of Spinney's earliest collaborations with Jim Henson as it traces Caroll's journey from bullied child to celebrated performer. This loving portrait peels away the instances that inspired his creation of Big Bird and as the yellow feathers give way to grey hair, it is the man, not the puppet, who will steal your heart. Proceeds from the show will benefit the Spring 2016 ArtsEZ Grant Round administered by the Northampton Arts Council. Mr. Spinney is now in his 80's and we are so fortunate to share an evening with him. Do not miss this opportunity to meet the real Big Bird in person! This year celebrate Valentine’s Day with RUDOLPH VALENTINO, the first and greatest lover of the silver screen. 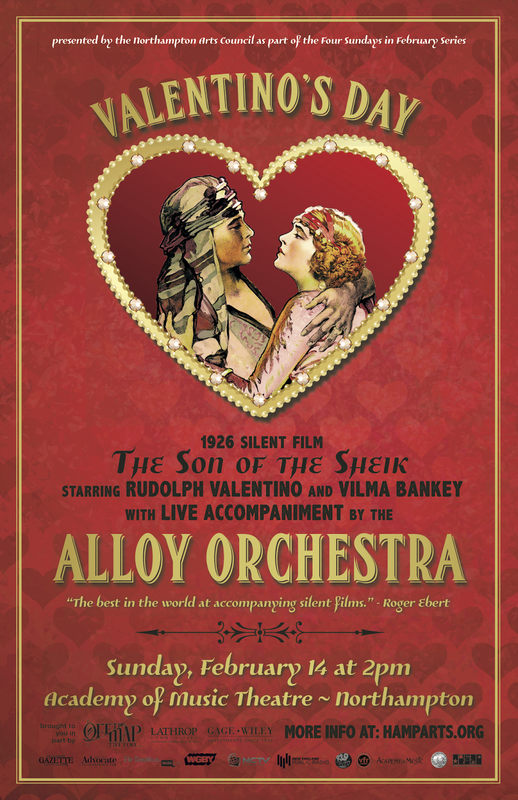 The Northampton Arts Council invites you to a special silent film presentation of THE SON OF THE SHEIK starring Valentino with live accompaniment by the world famous ALLOY ORCHESTRA on Sunday, February 14th at the Academy of Music Theatre in Northampton. THE SON OF THE SHEIK is a classic 1926 silent film starring Rudolph Valentino and Vilma Banky. 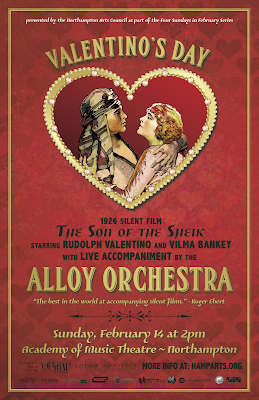 The ALLOY ORCHESTRA, “The best in the world at accompanying silent films.” (Roger Ebert), will play their newly composed score to the recently released 2K digital restoration of the film. THE SON OF THE SHEIK is Rudolph Valentino’s last and greatest film. 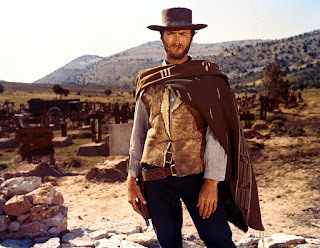 It is a film of passion, betrayal and redemption. Valentino is often cited as the silver screens' greatest lover, and this film demonstrates why his reputation is so justly deserved. Valentino died of a sudden infection just as the film was being released, unleashing an outpouring of love and support for the deceased actor, and insuring that the film would live on in the hearts and minds of the movie-going public. After the show at 4:00 PM, the public is welcome to sit in on a master class for Five College film and music students. The Alloy Orchestra will re-screen excerpts from Son of the Sheik and outline their compositional process, as well as the process of creating a digital restoration of the film. Five College students will have an opportunity to discuss this extraordinary undertaking with the group. The master class is co-sponsored by the Five College Film Council and the Smith College Film Studies and Music programs. While the event is free and open to the public, priority seating will be given to Five College students. ALLOY ORCHESTRA is a three man musical ensemble, writing and performing live accompaniment to classic silent films. Working with an outrageous assemblage of peculiar objects, they thrash and grind soulful music from unlikely sources. The effect of their live performance is mesmerizing. Don’t miss out---the Orchestra doesn’t visit Western Mass often! Northampton Jazz Workshop features guest saxophonist Charles Langford on Tuesday, February 2nd 7:30 to 8:30 PM followed by an open jazz jam until 10:30 PM at the The City Sports Grille at Spare Time Northampton, 525 Pleasant St., Northampton. 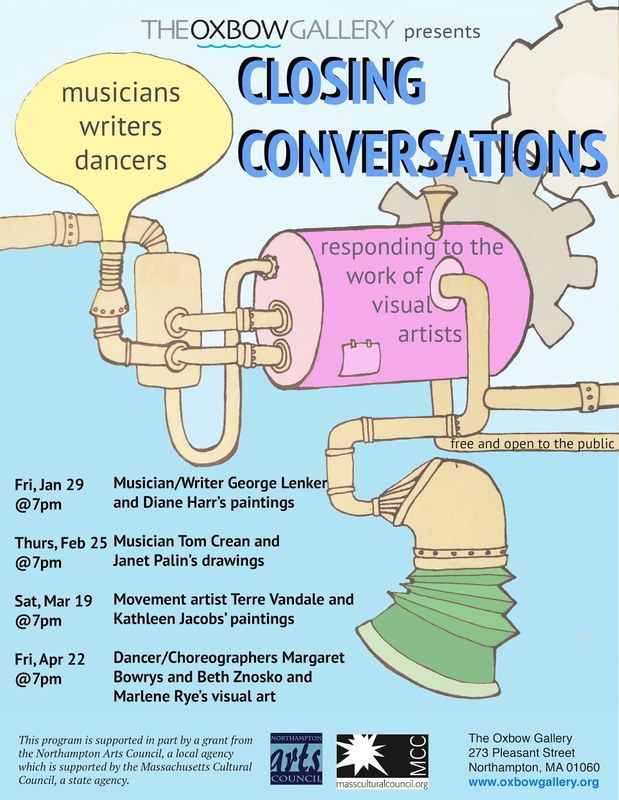 “Closing Conversations” presents four new interdisciplinary works at The Oxbow Gallery from January to April 2016. Artists of different media (music, poetry and dance) will be invited to view an Oxbow artist’s work, create a response, and present it during the closing week of the respective show. For example, the January show at the gallery will showcase visual art by Diane Harr. 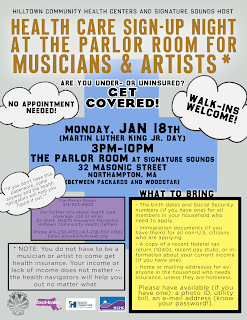 Writer and musician, George Lenker, will view the art and conceive a response inspired by what he has seen and experienced. He will then present his original creations to an audience while surrounded by the very art that inspired him. With this program, we hope to create new liaisons across media, encourage viewers of visual art to experience work in new ways, and invite a wider range of visitors to our gallery. 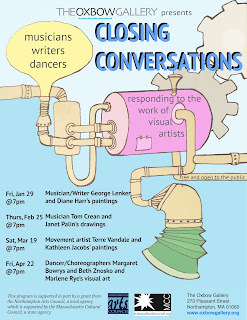 "Closing Conversations” will create an opportunity for members of the Northampton community to witness creative process and response, and to experience first-hand how artists inspire and fuel each other in supportive, exciting and unique ways. The series will also provide the artists involved and the audience members with the chance to view how visual and time-based art forms are both similar and different; and how common themes and motivations can create distinct and divergent artworks. The direct response aspect of this project will appeal to many new artists, and hence will create a new audience that can impact Northampton both culturally and economically. Diane Harr's current work in the front gallery is inspired by bejeweled Madonna paintings that she saw while living in Italy, and her work is largely influenced by Italian, particularly Roman, architecture. George Lenker is a musician, poet, and writer who writes and records music across many genres, which includes the 2012 CD "If Dogs Could Sing," a collection of songs written from dogs' point of view, to benefit rescue animals. He has played both solo and in various groups, including the popular 1980s band Cardiac Kids. Marlene Rye's work has been shown nationally and has been accepted into shows juried by curators from the Whitney Museum of American Art and the Guggenheim. This is not the first time dancers have created responses to her work, and vice versa. In fact, Margaret Bowrys has been bringing dance into interdisciplinary collaborations with local artists, including Rye. Bowrys recent work, Essential Voyage, is a collaboration with sculptor Valerie Gilman, and culminated in a full size sculpture at the base of the old maple tree on Amherst Common. Beth Znosko is the artistic director of the New Haven based dance company Collaborative Dance Theatre (formally Clark Dance Theatre). She has performed throughout Connecticut, New York, Massachusetts, and Rhode Island. Celebration and Fundraising Event to support the compilation release of LOCAL HONEY. With continued funding by the Northampton Radio Group—broadcasters of WRSI The River, WHMP and Hits 94.3—and the energetic support of Arts Night Out and the City of Northampton, the sixth annual Northampton Ice Art Festival returns on Friday, February 12. The public is invited to experience thrills and chills as icy masterpieces take shape at eleven downtown locations. Work starts early on the day, and completed pieces highlight Northampton's "Arts Night Out,” 5pm-8pm. They remain on display, sharing the love, throughout the Valentine’s Day weekend—longer, if the weather cooperates. And it’s looking good! 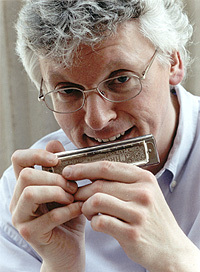 Northampton Jazz Workshop features guest Harmonica and vibes player Hendrik Meurkens on Tuesday, January 26th 7:30 to 8:30 PM followed by an open jazz jam until 10:30 PM at the The City Sports Grille at Spare Time Northampton, 525 Pleasant St., Northampton. Northampton Jazz Workshop features guest saxophonist Jason Robinson on Tuesday, January 19th 7:30 to 8:30 PM followed by an open jazz jam until 10:30 PM at the The City Sports Grille at Spare Time Northampton, 525 Pleasant St., Northampton. How the Pioneer Valley can use AS220’s Example as a Vehicle for Social and Economical Change. Providence- based AS220 went from being an from illegal squatting performance space to instigating a complete cultural transformation of a city that once known as the armpit of New England. How did they work their way from nothing to owning three multi-purpose, mixed-use buildings worth 25 million? How do they sustain themselves, stay true to an equal pay policy and work with the ongoing tumultuous landscape of arts funding? How can the Pioneer Valley learn from this model with the current opportunities and challenges of revitalization? How can the Pioneer Valley create more artist-driven ownership, cross-sector collaboration and partnerships, and stewardship for the future of the visual and performing arts? Currently there are projects both formal and informal happening in Northampton (Arts Trust), Easthampton (CitySpace) and Greenfield (The Bank Building) concerning space in terms of underutilization, revitalization and ways to work cooperatively. Let’s dig into how we can work together. Getting Pragmatic. Wearing the Business Hat without putting on the Suit. We’ll discuss how AS220’s three multi-use properties with an immense amount of programming functions on a day to day basis. Day 1 will cover real estate acquisitions, maintenance, finances, development, programming and classes. Yes, it’s a lot, but it’s a snapshot with room for group discussion about local opportunities and challenges. How does each unique community in the Valley deal with the same kinds of challenges? Who are the advocates in our area that can help with the minutiae and daily grind to pull off these kinds of projects? Seth Lepore is an Easthampton based performing artist, arts advocate and educator. He is co-founder of Easthampton Co.Lab, a social enterprise that fosters connection, engagement and community. A Rhode Island native, Lepore was fortunate to be part of the first immersive cohort put on by Practice/Practice, the consulting arm of AS220 in Providence, RI. The Immersive Residency for Artist/ Managers consisted of four full days of in-depth study, analysis and presentations led by AS220 staff and leaders. Lepore hopes to use this information to benefit the Pioneer Valley as a whole across creative sectors, and those invested in them. Part 2 will take place on Feb 21st and will focus on Community Engagement. Amrita Ramanan will co-facilitate based on her recent Network of Ensemble Theater's Local Organizer Training. The Northampton Arts Council is pleased to announce the awarding of 23 grants totaling $11,600 in support of a variety of projects. The caliber of applications this round was outstanding, and we were unable to fund many worthy projects. The Arts Council received 47 requests for almost $59,955 of funding. These grants were awarded in the following categories: Dance, Film/Video, Literature, Mixed Media, Music, Theater, and Visual Arts from funds allotted by the Massachusetts Cultural Council. Northampton Jazz Workshop features guest alto saxophonist Kris Allen on Tuesday, January 12th 7:30 to 8:30 PM followed by an open jazz jam until 10:30 PM at the The City Sports Grille at Spare Time Northampton, 525 Pleasant St., Northampton. 7pm at Northampton Senior Center, 67 Conz St.
S I N G ! It's good for body and soul. 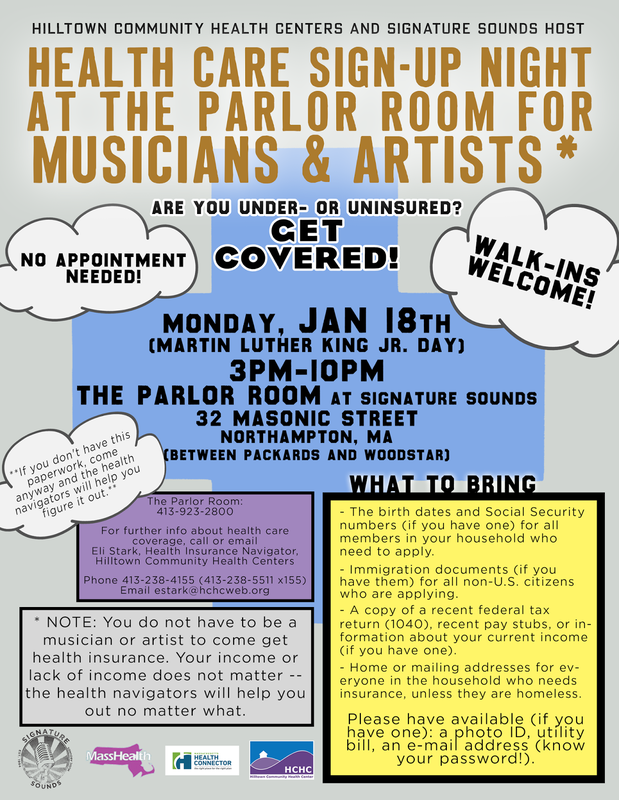 "Forget your troubles, come on get happy...."
COME SING IN THE NEW YEAR! JERREY ROBERTS-DAILY HAMPSHIRE GAZETTE : Ron Ackerman and Cleo Gorman sing during the monthly Group Sing. The Northampton Arts Council is accepting entries for YouthFilm 2016, part of the annual International film festival KidsBestFest, presented from February 15-19, 2016 at the Academy of Music Theatre. YouthFilm 2016 will take place on Friday February 19, 2016 at 1:30PM.